I’m going to take you back, back to my college days. I went to Utah State University up in the cute little city of Logan, Utah. It is a cute little college town. Not big at all but filled with its own charm. The thing I love about smaller towns like this one, is all the cute local places and shops. They are typically filled with the same cute charm that fills the city itself. Shortly after meeting my future husband, he took me on a date to this place called, “The True Aggie Cafe”. Aggies are Utah State’s mascot, hence the name. It was a darling sandwich cafe with literally the BEST sandwiches you would ever have the pleasure of eating. Not only where his ingredient combinations outstanding, but the bread he used was the best around town. It was soft and perfect, unlike Subway’s or Quizno’s sandwich bread. I actually didn’t mind eating the ends of the bread at his store. The store was ran by a kind man who actually was the store’s ONLY employee! You can imagine how long it would take you to get a sandwich, especially if there were multiple orders in front of you, BUT the wait was worth it. My FAVORITE sandwich on the menu, and actually still my favorite sandwich of ALL time, is called, “The Downtowner”. It is utter perfection. Trust me. I went there almost daily. I had earned several free sandwiches between all my completed punch cards. One day, I went to the door to order me another sandwich, when I read the sign: “We are sorry but we are CLOSED for business” WHAT?! No! This couldn’t be. How could he shut down my favorite place in Logan without even dropping me a clue, or where to purchase all the ingredients to recreate it in my own home?! I was devastated. I drove past the shop almost daily for a couple months, just to make sure it wasn’t reopening. It never did and was eventually transformed and combined as an expansion of one of the neighboring businesses. My heart broke a little. I was never going to taste “The Downtowner” ever again. I never had a fair warning. Fast forward to these days when I actually know how to recreate things. Back then I was a starving college student who could only morsel up a PB&J when needed. I am a changed person. I knew I could recreate it if I put my mind to it. But the bread. The bread was his secret. Where did he buy it from?! I bought bread from almost every local grocery store until I landed it, the closest (if not the actual) bread he used. I found the 12 inch loafs of bread at SAMS CLUB. If you have one near you, they are in a bag of like 8 and are the loafs you should use for the ideal Downtowner sandwich. Just my recommendation though. 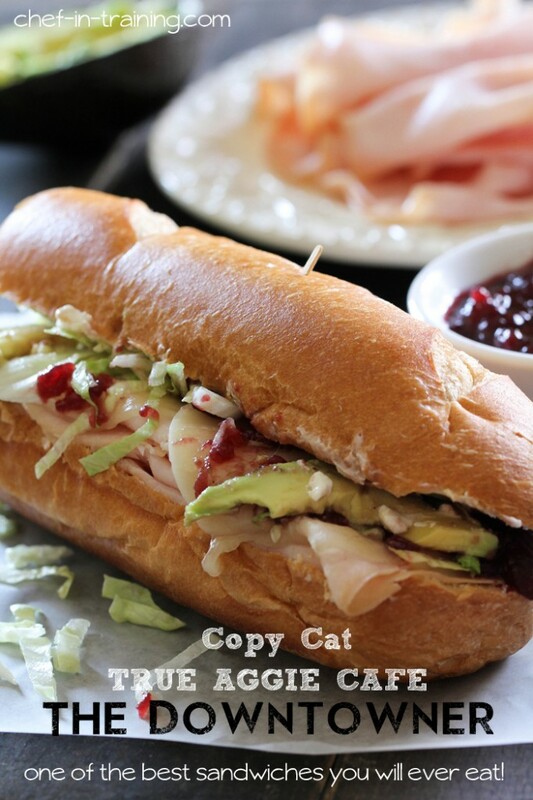 NOW the other great thing about this sandwich, it would BE PERFECT for your Thanksgiving leftovers. Read the ingredients to find out why. One of THE BEST sandwiches you will ever eat! And its perfect for Thanksgiving leftovers! Cut sub sandwich loaf in half length wise to create a top and bottom half of sandwich. Spread about 2 Tbsp. of cream cheese on the inside of each sandwich half. Sprinkle the top of the cream cheese lightly with dill. Place turkey slices on bottom half of sandwich and place the two slices of cheese over the top of turkey. Place sandwich halves on microwave safe plate and microwave the sandwich halves for about 30 seconds or until cheese begins to melt. Smear cranberry sauce over the top half of sandwich. Place avocado slices over to top of the cranberry sauce. Next place shredded lettuce evenly over the top of the avocado. Place the two sandwich halves together and enjoy! I am laughing because I went to USU, as well and know of these sandwiches. Though the thing I crave and cannot recreate from up there is Tandoori Ovens Lamb Saag, Indian spices still elude me. Girl your story-telling in this post is AWESOME! I feel like I'm right there with you and I can totally tell how much you loved this sandwich and good for you for recreating it! GREAT story and recipe too! cream cheese, avocado and cranberry??? This is a must try. Thanks for the recipe. Pinned. And wishing you and your family a Happy Thanksgiving. Wow! This DOES sound amazing! I'm anxious to try it out.....good thing I work at Sam's Club so the bread will be easy to nab Ü Thanks for sharing this sandwich recreation and Happy Thanksgiving! Yum! I went to USU as well, and was sad when we came back for a visit and tried to have lunch there, and it was gone. :( I'll have to try this at home now! so sorry about that. It should be fixed now :) Please let me know if you run into any more trouble. And congrats on your pregnancy!